Making your own pillow covers is an easy way to decorate your home for Christmas. Choose colors and prints that suit your holiday decorating theme if the traditional red and green don’t suit you. Measure the width of the pillow and add 1 inch: This measurement should be the width of your fabric. Measure the height of the pillow and add 2 inches: This measurement should be the height of your fabric. After you calculate the width and height, cut two pieces of fabric to serve as the front and back of the pillow cover. Then cut one piece of hook and loop tape the same width as the pillow (don’t add 1 inch). Fold the bottom edge of the pillow top 1/2 inch to the wrong side of the fabric and then press with the iron. Fold the edge in 1/2 inch again and press. Repeat this step for the pillow backing. Using a straight stitch on the sewing machine, hem the folded edge of the pillow top in place, using a 1/2-inch seam allowance. For a no-sew alternative, use fabric glue to bind the hem in place. Repeat this step for pillow backing. Separate the hook and loop tape, and then center and pin one piece on the hemmed edge of the pillow top. Sew around the edges of the hook and loop tape or glue the tape in place. Remove the pins. Repeat this step for pillow backing, using the remainder of the hook and loop tape. Place the right sides of the pillow top and backing together, making sure to align the bottom hemmed edges together. Pin the pillow top and backing together around all edges. Sew or glue around three sides (using a 1/2-inch seam allowance), leaving the hook and loop tape edges open. Remove pins. Clip the sewn corners and turn the pillow cover right side out. Insert the pillow and press the hook and loop taped edges closed. To sew a pillow, nix the hook and loop tape and all the hemming on the bottom edges. Start at Step 4 in the previous set of instructions and adjust the pillow bottom as needed. 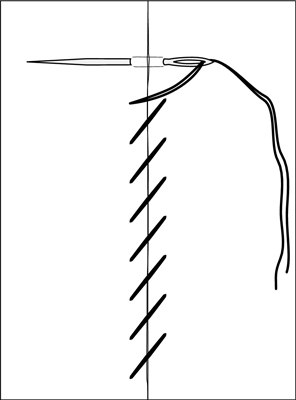 After inserting the pillow, just whipstitch the opening closed.